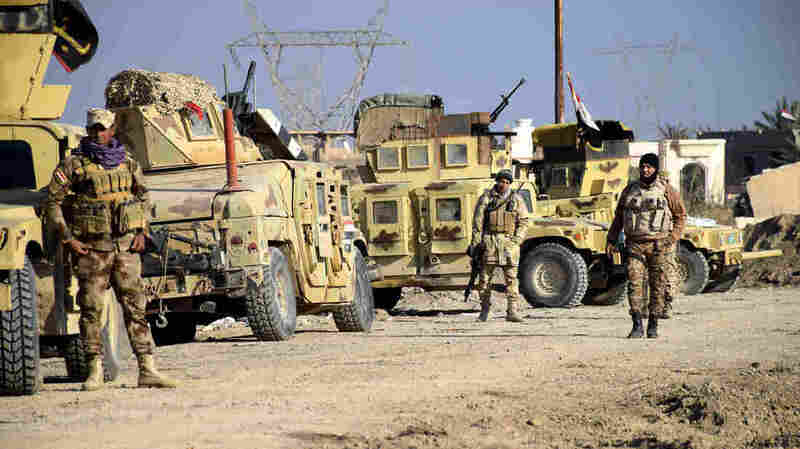 Iraqi Military Launches Offensive Against ISIS In Ramadi : The Two-Way The Iraqi military has encircled the city since last month. Now, with U.S. air support, it's pushing into the ISIS stronghold in the city center. Iraqi soldiers advance their position in northern Ramadi, 70 miles west of Baghdad, on Monday. Iraq's military has launched an offensive to wrest control of the city of Ramadi from Islamic State militants. "A 72-hour government deadline for civilians to leave Ramadi is over. Now, U.S. airstrikes are targeting ISIS positions, and Iraqi troops are pushing into the city center from three sides. The troops are working alongside Sunni tribal fighters and militiamen — against the Sunni extremists of Islamic State. "Ramadi, the capital of Anbar province, fell to ISIS back in May. Government forces encircled Ramadi last month, cutting the city off from other ISIS-held areas. But ISIS still controls most of the province, which borders ISIS-held territory in Syria." Iraqi intelligence officials say 250 to 300 Islamic State fighters are still positioned in the city center, about 70 miles west of Baghdad, Reuters reported. The wire service says a victory in Ramadi would boost Iraqi troop morale. "Retaking Ramadi would provide a major psychological boost to Iraqi security forces after Islamic State seized a third of Iraq, a major OPEC oil producer and U.S. ally, last year," says Reuters. Last week, President Obama said that ISIS has "has lost about 40 percent of the populated areas it once controlled in Iraq."